Ah, the 80s. Where would crazy killer mutant alien creatures be without this glorious decade? 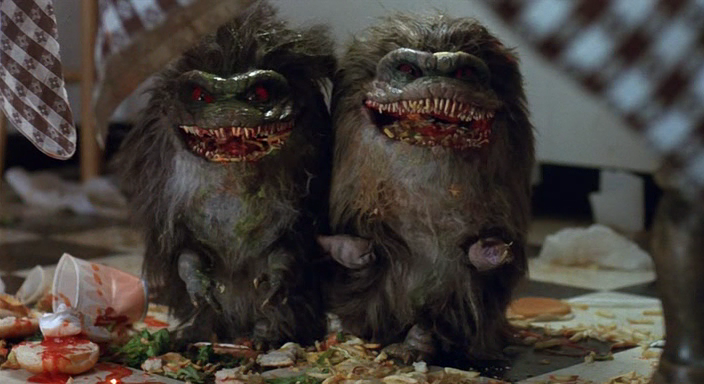 Critters is one of those movies that isn't afraid to make fun of itself. I mean, it's hard to be scared of tiny little rolling fur balls with teeth. They're like piranhas if they had hair. The setup is pretty standard. The brood of flesh eating killing pint sized aliens crash land on Earth at a small farm house. They immediately began a killing spree and just as things start to go south, another ship shows up with a couple alien bounty hunters show up and start creating the own havoc. It's up to the lovable idiot and the young teen to take out the critters and keep everyone safe from the bounty hunters. In the end, the alien critter menace is quelled and the idiot goes to work with the bounty hunters. You know, the typical Hollywood ending. This movie was one of my favorites growing up. It came out in 1986 and had a number of b-list stars from Dee Wallace Stone to E, Emmett Walsh and even a young Billy Zane. The movie was a commercial success and spawned at least three additional movies. I guess everyone couldn't get enough of the furry piranhas. It's filled with enough humor to make it funny without being ridiculous, but scary and gory enough to keep people interested. Sure, the critters themselves may not be too threatening, but this movie is definitely one of the best the 80s has to offer. Disney devours Lucasfilm: ‘Star Wars’ Episode VII is Coming!